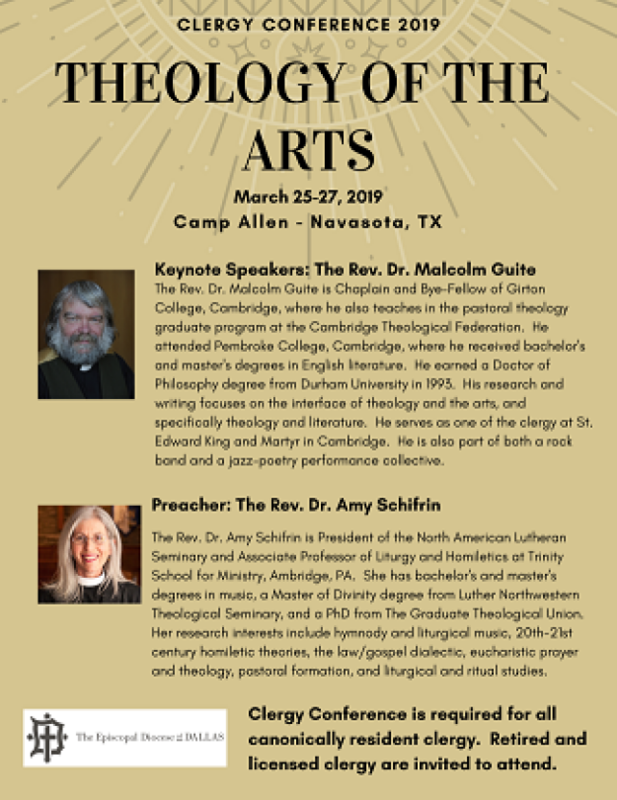 I write on behalf of Bishop Sumner to invite you to this year's clergy conference, coming up March 25-27 at Camp Allen in Navasota, TX. First things first: Please fill out the registration form at the link below by Friday, Feb. 22, so that we can make final arrangements. Canonically resident clergy are required to attend, while retired and licensed clergy are warmly invited but not required. This year, our keynote speaker is the Rev. Dr. Malcolm Guite, Chaplain of Girton College, Cambridge University. Dr. Guite is a poet, musician, and theologian who also happens to be part of a rock band and a jazz-poetry collective. His sessions with us will explore what it means to do theology through the arts, making the case for the imagination as a truth-bearing faculty, looking particularly at Shakespeare, George Herbert, and Seamus Heaney. He also plans to bring his guitar and do some singing during the evenings, so Bishop Sumner invites everyone with a musical instrument to bring theirs and join in! Our guest preacher this year is the Rev. Dr. Amy Schifrin, president of the North American Lutheran Seminary in Ambridge, PA. Dr. Schifrin's research interests include hymnody and liturgical studies, and she tells me that she spent many years doing ministry in my native North Dakota, so I am pretty sure that I like her already. Rooms are double occupancy, and we ask for your top 4 choices for roommate. We do our best to accommodate as many requests as possible. As we did last year, we are offering a limited number of single rooms at a cost of $75. These are available on a first come/first served basis, and your request is not completed until your payment is received by the Diocese. You may mail payments to: Episcopal Diocese of Dallas, Attn: Laura Faulkner, 1630 N. Garrett Ave, Dallas, TX 75206. If you have any questions, please contact myself ( ) or Laura Faulkner ( ). See you at Camp Allen! All of us at 1630 N. Garrett Avenue pray it will be a time of refreshment, reflection, and late-night guitar pickin'. Rooms will be double occupancy: 2 people/2 beds. Single Occupancy is very limited and will be filled on a first come first served basis at a cost of $75 per person. Single room request is not confirmed until payment is received at the Diocese. Please assign me a roommate. I request a single room and will send payment. Try to pair me with one of the people listed below. Please let us know of any special needs you might have. If you have any questions or problems with registration, please contact Laura Faulkner: lfaulkner@edod.org or 214-826-8310.